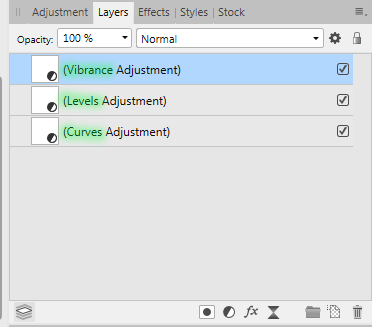 The name of the adjustment layer is not equal to the name in the selection menu. Unnecessary words complicate perception and slow down the search in large documents. Curves = Сurves - This option is visually more pleasant. We immediately see what this layer is. Well, for those with PS moves less repulsive moments. If for the English language this is not very critical (although this still overloads the interface). The most important words are at the beginning, and they are immediately visible. In the Russian version everything is much sadder. The most important word is in the middle of a sentence. And it is still necessary to search. The short title option would be the most usable. A document with a huge number of layers overloaded with unnecessary words, which in fact do not carry important information. It looks frightening and repulsive, especially for new users whose loyalty to the program at the start is minimal. I agree that there are too many words. It’s obvious that ‘Vibrance’, ‘Levels’ and ‘Curves’ are adjustments. In the English version there is only the word ‘Adjustment’ but in your screenshots I see two different words: ‘коррекция’ and ‘корректировка’. Google Translate tells me that ‘коррекция’ means ‘correction’ and ‘корректировка’ means ‘adjustment’. "коррекция" and "корректировка" - translated correctly. So it should be. But these words are superfluous. They do not carry (important) semantic load, but they visually overload the interface. Is that not indicating what kind of layer it is? Of course, but the label ‘(Vibrance)’ should be all you need, especially since the thumbnail has an adjustment icon — the black and white circle — overlaid on it. Right, points. When I opened the AP for the first time and saw this ... Why do I need so much obvious information? When you see one word, it is clear that this layer is immediately. When you see a sentence, you have to ponder it, read. And when there are a lot of layers with long names, it becomes hard to find the right one. It's like on the door handle of the car the inscription "this is a door knob" seems to be true, but why do I need it? This information is obvious, does not carry additional semantic load. When we choose from the drop-down menu from short names, then we understand everything. The long name in the layers panel only brings in some visual chaos. Short layer names look neater, while remaining equally understandable and functional. You and I are using the app in English, where it isn’t a major problem. In the Russian language interface that @Max N is using, ‘Curves Adjustment’ becomes ‘Корректировка кривых’, giving undue prominence to the ‘Корректировка/adjustment’ part of the label. 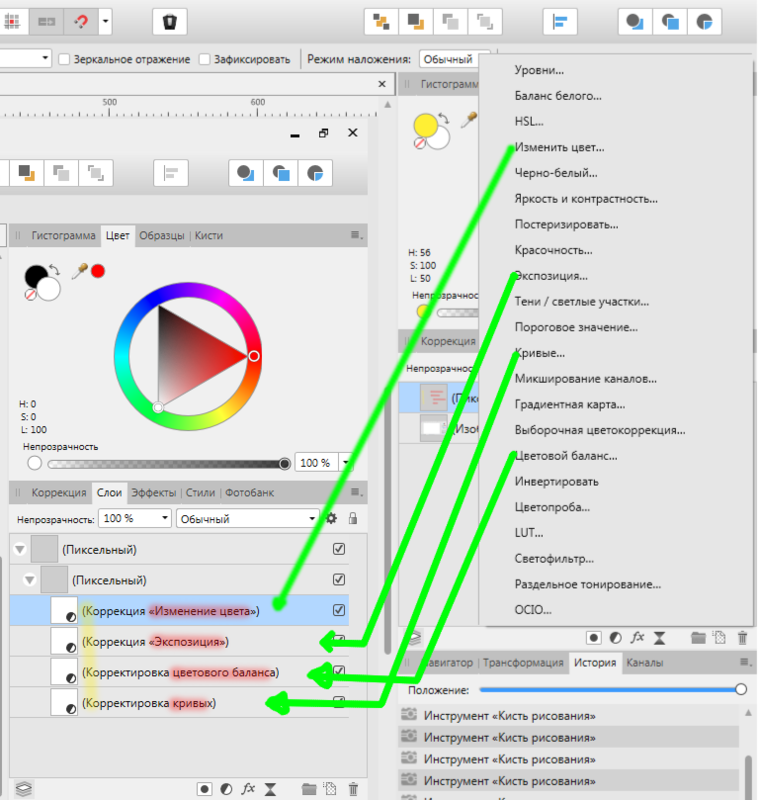 Regarding visual overload of interface there is a lot can be improved... some RU translations are make tools less usable than before. 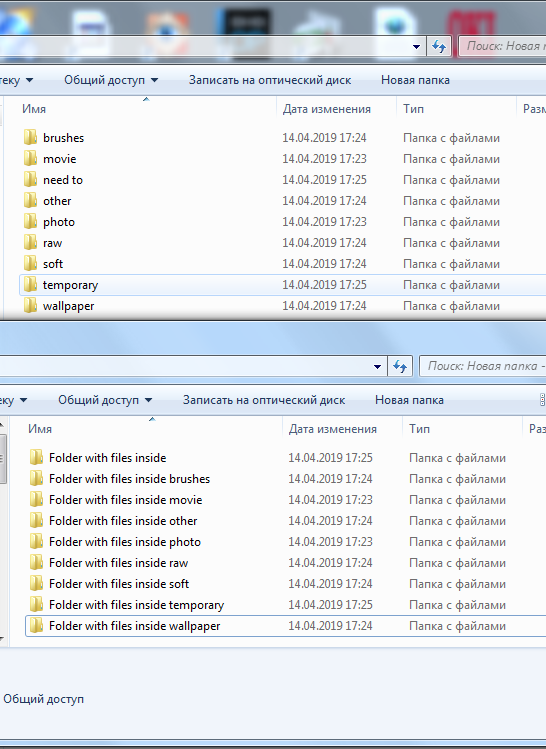 Imagine if windows would add to the folder name that it is a folder with files. Which option will be more convenient? Top or bottom? Here the user who switched from PS to AP sees the same picture. It is not necessary to write on the folder that this folder, on the archive in the title, too, it is not necessary to write that it is an archive. This is obvious in understanding and inconvenient in perception ..
That is apples and oranges Max. Not at all! It was an excellent analogy. This is the industry standard and deviation from it. My specialty is automation technology engineering. I well understand that the loss of 10 seconds in the operation does not look scary. But within the framework of the technological process, the operation can be repeated millions of times, and this is no longer 10 seconds of losses. AP is a replacement for the PS (industry standard). In many ways, AP is superior to PS. 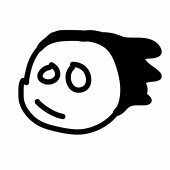 But there are little things that can slow down the process and I pay attention to them. Perhaps this is obvious to me as a result of my education. Perhaps for the average user is not so obvious. I sincerely wish that the AP would develop and become better, so that new users (during the test period) were faced with a minimum amount of inconvenience, and saw more advantages. Then the market share of AP will grow and, with time, the AP will significantly push PS. I've moved this to feature requests. Shhhh. Do not give them ideas. Overall I think your original suggestion is quite a good one. Less reading means less fatigue.